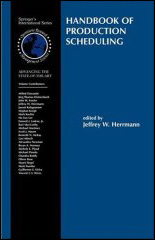 Associate Professor Jeffrey Herrmann (ME/ISR) is the editor of a new book, Handbook of Production Scheduling, the latest in Springer's International Series in Operations Research and Management Science. The volume concentrates on real-world production scheduling in factories and industrial settings. It presents scheduling principles, advanced tools, examples of innovative scheduling systems, and includes a variety of real-world scheduling issues and analyses. Industry case studies that use innovative techniques as well as academic research results are included to improve real-world production scheduling.